Hi there! This is Hilary from Primary Planet (formerly known as: Second Grade is Out of This World) and I wanted to share with you one way that we work on reading fluency in my classroom! Here is how it works in our room. 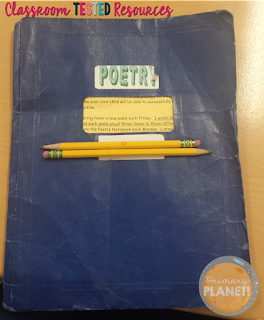 We have all of our poems stored in our Poetry Notebooks. This is a 3 prong folder and it already has all of our "Poem of the Week" poems in it. This is a collection of a myriad of different poems selected for something that we are working on for that week. Some of them are just for fun. We accidentally ordered ones with the window in the front, but we make do! As you can see, it is a little beat up, but they have held up pretty well. I think that next year I may try using a binder. 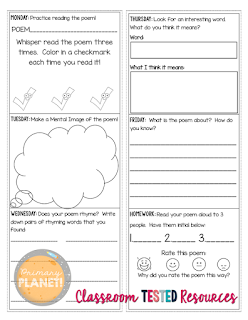 It will be easier to add poems that we use for other things in class. What does this have to do with reading fluency? Well, multiple readings of the same text leads to better fluency. We read our poem of the week at least once everyday during our morning meeting. 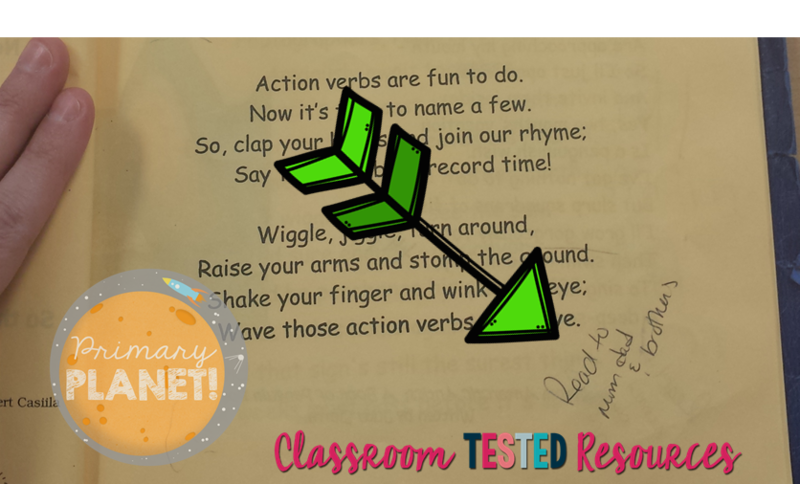 I model good fluency: speed, punctuation, and reading with expression. The kiddos read right along with me using the same fluency. They also practice reading their poems to a friend during Read with a Partner. On Fridays the kiddos take their poetry notebooks home and read it to three people (can be the same person three time, can be different people, they can read to their dogs or stuffed animals). It gets initialed and returned to school (or parents can initial the response strip). This is a reading homework grade. The kiddos love sharing their poems with their families! I do have a little freebie for you! This is the poetry response strip that I mentioned above!